Understand it before you think of buying it. Most working adults require life insurance to ensure that their dependents (i.e. their children, spouse and elderly parents) have sufficient income in the event any unfortunate circumstances befall them. There are two main types of life insurance that a person can consider when looking for policies to protect their dependents. “Whole Life insurance” and “Term insurance.” The main difference between the two are that whole life insurance is for the duration of a person’s life (up till age 99) while term insurance is for a fixed period of time as requested by the policyholder. In addition to that, whole life insurance comes with a cash saving component as well. Regular readers of DollarsAndSense.sg would know that our editorial team mainly prefers term insurance simply because of the much lower cost of coverage that you need to pay. 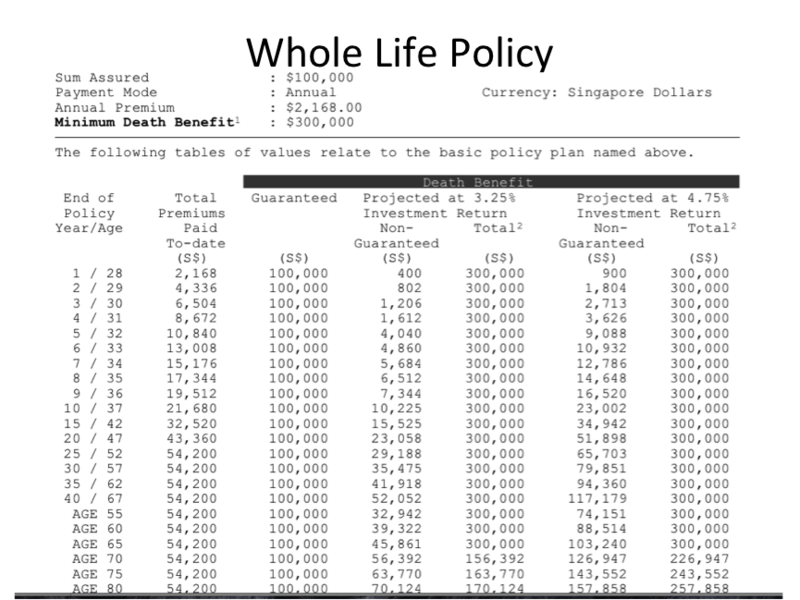 Still, we know many people in Singapore who would buy a whole life insurance instead. 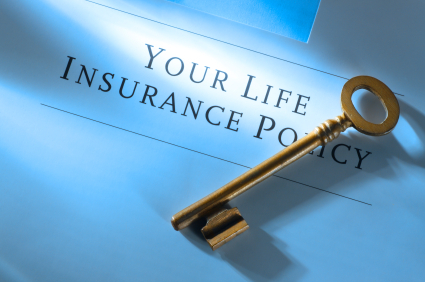 As such, we hope this article will help explain how whole life insurance work. One of the key selling points of a whole life insurance is that policyholders only pay premiums for a limited period in return for life coverage. For example, purchasing whole life insurance may entail paying an annual premium for 25 years. Following that, payment would stop, but coverage would continue to persist. Here is a benefit illustration of such a policy. We can see that the premium per year is $2,168 (or about $180 per month). This would be payable for 25 years (till the policyholder is age 52). There is a multiplier effect of 3 times the sum assured till the age of 70. What this means is that a policyholder who has a sum assured of $100,000 (as illustrated in this policy) would get a payout $300,000 if death occurs before the age of 70. Do note that not all whole life insurance have this multiplier. While the minimum guarantee of coverage after age 70 is $100,000, there is also an investment component that would allow for a higher payout. What happens for most whole life insurance is that policyholders would pay higher premiums compared to term coverage. After taking into consideration the insurance costs, the higher premiums paid goes into what the insurance company calls a participating fund. What this fund does is invest on behalf of policyholders into a range of financial instruments such as stocks and bonds in order to obtain investment returns for policyholders. It is important to note that these returns are not guaranteed. 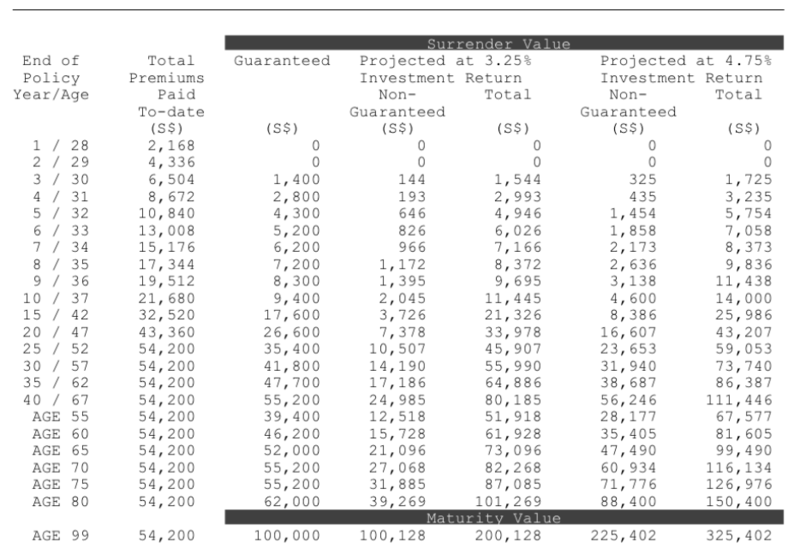 In other words, the 3.25% and 4.75% that you see in every insurance illustration are merely examples of how much you can expect to get should the participating fund attain the returns over the long run. Since there is a cash component included in the whole life insurance, it also means that a policyholder who surrenders the policy would get back some cash. Below is an illustration for the surrender value. If you look at the details, you would notice that the surrender value differs significantly from death benefits. If death were to occur at the age of 65 for a policyholder, the payout would be $300,000. However, if you were to surrender the policy, you are only guaranteed $52,000, though the amount could be higher depending on the performance of the participating fund. Simply put, the death benefits would generally always be higher than the surrender value provided by the policy. To conclude, what a whole life insurance does is provide life insurance coverage to a policyholder at a higher premium than term insurance. Upon the completion of the payment of premiums, a policyholder would enjoy coverage for the rest of his life until he or she passes away, or surrenders the policy. Due to the higher premiums being paid, the policy, when surrendered, would provide a cash component to be returned to the policyholder. This cash component has both a guaranteed and non-guaranteed portion to it. The insurance company provides the guaranteed portion. The non-guaranteed component depends on the performance of the participating fund that the insurance company has invested the money with. Most people are attracted to whole life insurance mainly due to the fact that payment is for a fixed period while coverage extends for the entire life. The cash component also makes it more appealing. However, people should remember that ultimately, these features are the reason for having to pay much more for similar coverage than term insurance. Our advice would be to ask your insurance agent how much a similar term insurance would be and to compare the cost between the two before deciding which option to go for. Prudential Endowment Plan – A Simple Case Of Misselling?